Xenia wide receiver Meechi Harris breaks through the Xenia High School football team banner prior to Friday’s Oct. 6 road game with Riverside Stebbins. Xenia won the game to record its first win of the season. Reports were that first-year Xenia coach Trace Smitherman did not instinctively walk into the Stebbins locker room prior to Friday’s game. Smitherman coached at Riverside Stebbins a year ago. Xenia’s 28-14 win Oct. 6 over the Indians was the coach’s first as Bucs coach. 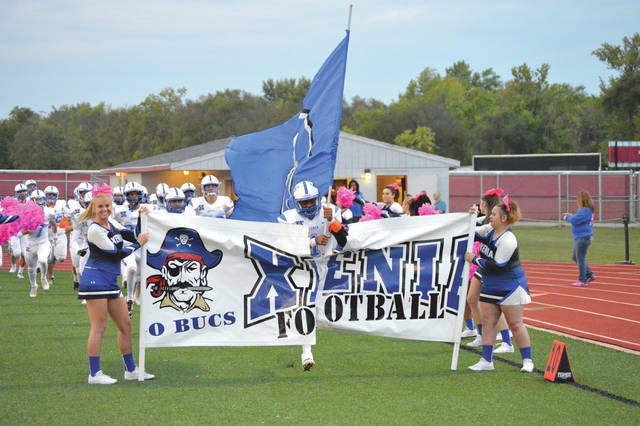 GREENE COUNTY — Congratulations goes out to coach Trace Smitherman and the Xenia Buccaneers in collecting their first win of the 2017 season, with a win over Smitherman’s previous school, Riverside Stebbins. After weeks of going up against playoff contenders and Division-I schools, the Bucs are finally getting to face some schools their own size. Oh, just like everybody else who plays them, Xenia will take its lumps next week when they play the state’s top-ranked Division III program: Trotwood-Madison. But games (this week) against West Carrollton and next against county and divisional rival Fairborn ought to be more to their liking. Greeneview won handily last week to remain undefeated. Through no fault of its own, the Rams’ relatively weak regular season schedule could hurt them in the Division V regional computer points chase. Greeneview has games against two Division VII schools (winless Cedarville and 3-4 Springfield Catholic Central) before closing out the season with 3-4 London Madison Plains. Depending on how other teams in its region fare from here on out, it’s conceivable that the Rams could finish undefeated and not make the playoffs. Not likely, but it could happen. Losses by playoff contenders Beavercreek and Bellbrook have put a dent in those teams’ respective post season hopes. Beavercreek’s loss to Huber Heights Wayne bumped them out of the top 8 in Division I’s Region 3, down to No. 10. They’ll face No. 9 Springfield on the road in a must-win game for both schools on Friday, Oct. 13. Bellbrook has had the misfortune of playing two state ranked teams in a row — SWBL foes Germantown Valley View (No. 2 in Division IV) and Franklin (No. 8 in Division III) — and losing by a combined total of 12 points. The computer rankings don’t worry about point margin, though. The Golden Eagles are now No. 9 in the Division III Region 12 computer standings. Sincere Wells, RB, Xenia — The Buccaneers’ featured back, Wells (5-foot-9, 190 pounds) rushed for 153 yards and scored three touchdowns on just 12 carries in Xenia’s win over Riverside Stebbins. 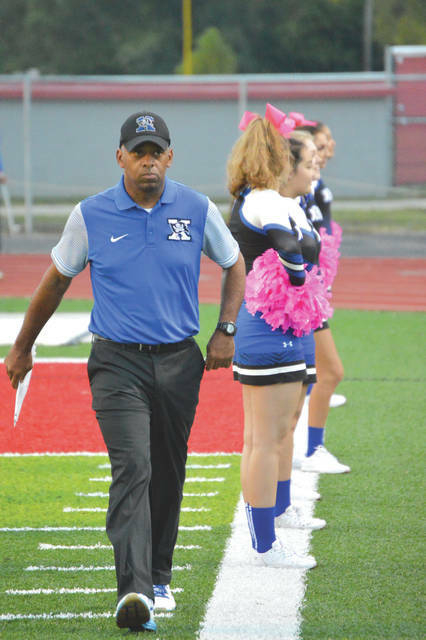 Congrats also goes out to Xenia coach Trace Smitherman for recording his first win as Bucs coach. Golden Eagles passing attack — Jack Campbell snared four passes for 80 yards and a score, and Ethan Savey caught three passes for 53 yards in Bellbrook’s narrow loss to Division III No. 8-ranked Franklin. Quarterback Brendan Labensky connected on 10-of-19 pass attempts for 169 yards and a score. Unfortunately, three of those passes were intercepted by the state-ranked Wildcats. KadenWenger, RB, Beavercreek — The Beavers’ 5-foot-10, 170-pound senior running back gained 137 yards on 22 carries, and scored a touchdown against one of the area’s top D-I football programs. Wenger is currently second in the entire Greater Western Ohio Conference with 1,175 yards rushing this season. He has eight rushing TDs thus far. Justin Sloan, RB, Bellbrook — After his fourth straight 100-plus yard rushing game, Sloan is now ranked sixth in the Southwestern Buckeye League in rushing with 769 yards gained on 139 carries, with four touchdowns. He rushed for his second-best total of the season — 127 yards — in Friday’s loss at Franklin.